Learning New Skills Should Be an Adventure! And not an adventure like an “Oops, we just took a wrong turn down a dark alley and are now being taken to meet a ‘friend’ of the sketchy looking guy that just appeared, and what could possibly go wrong?” kind of adventure. But in a “I didn’t know my software could do that, and my mind is blown, and I’m so excited to put this all into practice on my next project!” kind of way. That level of excitement is what I strive to bring to my training–whether in person or online–as well as through my writing. If you’re ready to dive into your creative software, or if you only want to dip your toe in to test the waters, I’d love to share my enthusiasm and passion with you. As a speaker, trainer, and writer, I create content around software for creative professionals. I focus mainly on InDesign, Illustrator, and the mobile creativity apps from Adobe, as well as Apple Keynote and iBooks Author. Contact me at learn@ericagamet.com and let’s chat about how we can work together! 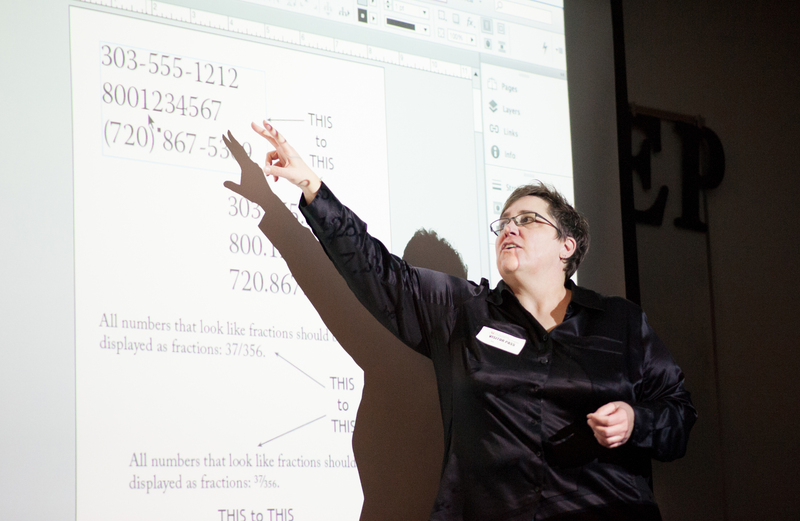 I provide on-site training in InDesign, Keynote, and other topics throughout the Pacific Northwest, including Seattle, Tacoma, Olympia, Portland, and Eugene. Are you further away? No problem. Contact me about traveling to your location to train your team. Want to learn with one-on-one guidance? Contact me to set up your remote video tutoring schedule, no matter where you are in the world! On your own, be sure to check out my YouTube channel for videos packed with tips & tricks, how-tos, and general geekiness from InDesign text styles to Keynote transitions to the tech gear I travel with. Be sure to subscribe so you never miss a new video. I love to talk! Book me as a speaker for your next event. I am available for workshops, conferences, expos, and classroom environments. Topics include workflow, InDesign styles, automating with GREP and scripts, production efficiency, using Apple Keynote in a design workflow, and many more. Please contact me to create a customized program. If you’re a designer with overflow production needs or just hate doing production “grunt work,” I can help! Let me be your production department and take those tasks off your hands. With 30 years in the graphics industry, I’ll make your beautiful designs ready for print or digital delivery. Not a designer? I also provide freelance design and production to individuals and businesses. Let’s talk about working together on your next project! Your level of knowledge is impressive, yet you make it very accessible. Thank you! This class was like being in a candy store for me. So many great things. I loved it! Erica was well-versed in the subject matter, approachable, and used relevant examples. If you’re ready to have fun while learning new skills, click below!